I spent Saturday morning learning just how important food is to building a sense of community. Members of Windsor's fledgling community garden cooperative Fed-Up Windsor made the trek across the border to Detroit to see how Earth Works (who's motto is "Connecting Urban Detroiters With Nature") has accomplished all that they have. According to the American Community Gardening Association, "... community gardening improves the quality of life for people by providing a catalyst for neighborhood and community development, stimulating social interaction, encouraging self-reliance, beautifying neighborhoods, producing nutritious food, reducing family food budgets, conserving resources and creating opportunities for recreation, exercise, therapy and education." grew into what is our Urban Farm project today. a working study in social justice and in knowing the origin of the food we eat"
So we made the trek over to see what we could learn from them. Myself being the transplanted urban-boy-grunt work (I've seen a farm, once...:), I had so much to learn. While I didn't learn the nuances of sacrificial plantings or nitrate-building ground cover, I did see first hand how numerous different people from different socio-economic backgrounds, when they get around dirt and worms and compost, seem to lose all inhibitions and cooperate towards a common goal. When we take food production for granted, we tend to lose the connectedness it brings, and this is something that I hope Fed-Up Windsor can bring back into our community. 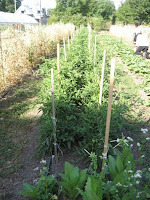 From one of my gardening comrades blogs... "We also learned quite a bit for our own FedUp community gardening project, which currently has three plots here in Windsor (at the Ecohouse on Sunset Ave, on Malden Rd, and on Moy Ave), and is already giving us some zucchini, cucumbers, tomatoes, and peppers. We have no website up yet, but that is a near-future project, and we are always looking for more volunteers, small plots of land, and other resources. We meet every Sunday at 6pm for a potluck in the backyard of the Ecohouse, where we divvy up the week' harvest and make plans for future gardening adventures. " I will try and give you some information about Fed-Up in the near future if you are interested in participating. If you want to head over to Detroit and do your thing at Earth Works, they welcome any and all volunteers on Wednesdays and Saturdays. Just get in touch with them through their website. Posted by Chris Holt at 4:48 p.m.